Join Kimberly Hanson and the staff of the Las Cruces Museum of Nature & Science (MoNaS) for Dinosaur Train! On the third Thursday of every month, MoNaS invites children ages 3 to 5 to the museum to learn about paleontology and ancient environments. This collaborative effort between the Railroad Museum and MoNaS will take place on Thursday, March 19, at 9am in the Museum of Nature & Science’s classroom. This month, come learn about ancient marine reptiles! Millions of years ago, the seas were filled with giant reptiles – discover what they looked like and then make an underwater seascape after the lesson. The Railroad Museum will also be providing trains for our preschoolers to play with! No registration is required and the event is free of charge. 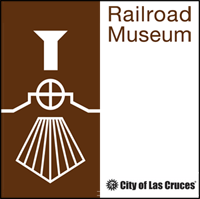 The museum is located at 411 North Main Street and is open Tuesday through Saturday from 9:00 a.m. to 4:30 p.m. For additional information, visit the website at: las-cruces.org/museums or call (575)522-3120.